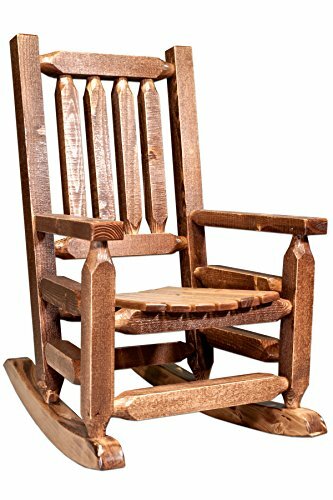 This children's sized rustic rocker is built to be a family heirloom. Genuine lodge pole pine timbers assembled using the famed mortise and Tenon joinery system will comfortably support your children, their children and likely even the next generation. This rocker is spray finished with multiple coats of stain and clear lacquer for a finish that is both durable and great looking. Comes fully assembled. Ergonomic design. 20-year limited warranty from manufacturer included. Weight capacity 350 pounds. Made in the USA by Montana Woodworks, a One Good World verified company. Founded in 1991 in the remote area of West Kootenai, Montana, Montana Woodworks has grown to become one of the largest, most trusted manufacturer of rustic furniture in the nation.